IT'S GRILL TIME | A.B.E. Remodeling, INC.
We sure hope you all had a great July 4th. The weather gave us some great days this past weekend. It was great for those special events of the holidays. There's something about seeing those beautiful fireworks light up night skies and hopefully we are all reminded of the freedoms we have. 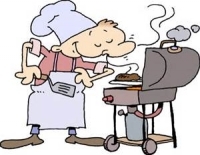 Now that summer is here --> it sure is grilling season SO who is THE GRILLER in your life?? Who rules the cooking of the foods on the grill at your house? Who handles the BBQ tools in your family? Who wears that apron? Is it the husband - is it the wife or is it a shared hobby. Isn't grilled food just a bit more lively tasting then stove and oven made foods. So let us know who IS the griller at your place. SHARE your wild grilling stories with us. Got a favorite recipe to post....visit and like our FB page. We welcome your imput. Now get outdoors and grill, grill, grill. Share your recipes.